This has been a horrible week, not only have we been in the grip of a hot and humid heat wave, we have also been inundated with dust. It’s a weather alert I never had the dubious pleasure of receiving. It has been awful. 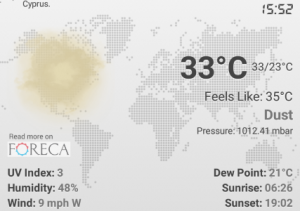 There is something supremely depressing about the occurrence of high temperatures, but having to keep all your windows and doors closed because the air is so full of dust that it is impossible to breathe. Washing left out? Yes, I did, I left it out overnight and it so happens that it was all whites and light colours, that lot will need to go through the wash again. I’ve had washing piling up in my wash basket, but can’t wash it because I can’t put it out to dry. Cleaning to do? I have a tonne of cleaning that I want to do before my parents’ visit (you know, cleaning walls, floors, doors, furniture etc. The entire house has to sparkle, even the matte bits), but as soon as I clean something it’s covered in dust, literally. Writing to work on? Yes, I have plenty to do and other bits to work on, but I have been forced to move from my usual (shall we even say routine) spot and the words are refusing to flow. I have two short stories in the ‘first draft stage’ and no matter how I try, I can’t get them to cooperate. I have never considered dust as a potential spoke in my creative wheels, but now I have to acknowledge that it is a potential issue, when it removes me from my inspirational source. The only thing in my head now is the ‘Fat Fighters’ sketch from Little Britain. I’ve continued to keep up with the news, but everything in the news seems to be ‘migrant crisis’ related. Syrian refugees aren’t causing a problem in Cyprus, but Syrian sand is. This entry was posted in Blog and tagged Dust by Mamie. Bookmark the permalink.